August | 2016 | Educate.Empower. Many homes are using patches of their backyards for veggies patches and making the most of windowsill space. We loved reading this story, not only watching the plants grow in strange places but also watching the people come out into their city to cultivate and enjoy the green space. Find some easy to grow seeds that produce colourful results – plenty of different types os sunflowers and everlasting native daisies are wonderful! The Diggers club have some great heirloom seeds on offer, worth checking out! A fresh legacy is also a great website for tips on how to grow a great veggie patch with your family! I just listened to a great podcast by Laura Trotta with special guest Jessica Donovan. It highlights the importance of trying to grow some small amount of your own food. By growing your own food it gives your child a great link to where their food comes from, how long it takes to grow and how we need to help plants to grow. You can check it out here. With your children get out your tape measures and scrap paper and plan your dream garden. Would you create a small maze out of lillypilli bushes? A herb maze? A stingless bee hive? A sunflower patch? Native flower garden? A recycled water feature? The possibilities are endless and you can have so much fun doing it! Do you work somewhere where you could plan a rooftop garden? If you do see if you can otherwise have some fun planning a rooftop garden on your apartment, townhouse or house roof or walls! How about investigating edible weeds? I haven’t done it yet but I am keen to find out what we can eat in our own backyard. We don’t spray our grass and it’s only the chickens who peck and poo all over it so I would guess our dandelions and purslane and other weeds could be an added delicacy! Part of growing your own garden is about having fun. We even planted some seeds in an old shoe as we lost the other shoe! Have fun, try something new and get outside! Measurement – mm, cm and m.
Understand the importance of biodiversity and the need for different flowers and plants. Mechanica: A beginner’s field Guide by Lance Baldachin. How would our planet look if insects did not exist? Can butterflies be beautiful and brutal? Are drones a necessary evil? This very impressive picture book with detailed diagrams of futuristic insects, small animals and birds captured my attention immediately. Children will love reading the details about each creature and looking at the intricate designs Lance has included. There is a glimmer of hope in the Addendum – perhaps nature will always fight us and our consuming ways. How can you use this book at home or in the classroom? Choose any insect in our world and explore how that insect helps us to grow food, keep soil healthy or rid waste. Create your own Mechanica creature. Give it a new name. Outline the details similar to Lance Baldachin descriptions. Create the life cycle for these Mechanica. How is their life cycle altered when they turn bad? What are drones? Explore the history of drones and wonder if we really need them…. Using a world map find out where these futuristic creatures live. Ask why they might live in these regions and not others. What sort of Mechanica could live in your home town? Write a journal from the perspective of Miss Liberty Crisp. Outline her journey through the Orient, her experiences in Saraswati and her excursion to the National History Museum. Write a persuasive outlining to others the importance of starting to take care of the world we live in. Present this in a TV advert – make it catchy, straight to the point yet entertaining. Create your own mechanics using recycled materials. Find old nails, bolts, cutlery etc. Not only are you creating something from waste but you are also alerting children on how much waste we do create! Despite repeated warnings, the environment has become polluted to such an extent that many areas of the globe have become uninhabitable, and wildlife is now extinct. From the ashes, a new style of ‘wildlife’ is created. Wildlife that will not remain harnessed by humankind. Welcome to the world of Mechanica. Why should you read picture books? Your child will be exposed to rich vocabulary which in turn will help their reading ability. Picture book writers use a variety of language such as alliteration, rhyme, metaphors and similes. Early exposure to this eclectic mix of language devices will equip your child for their own language development. 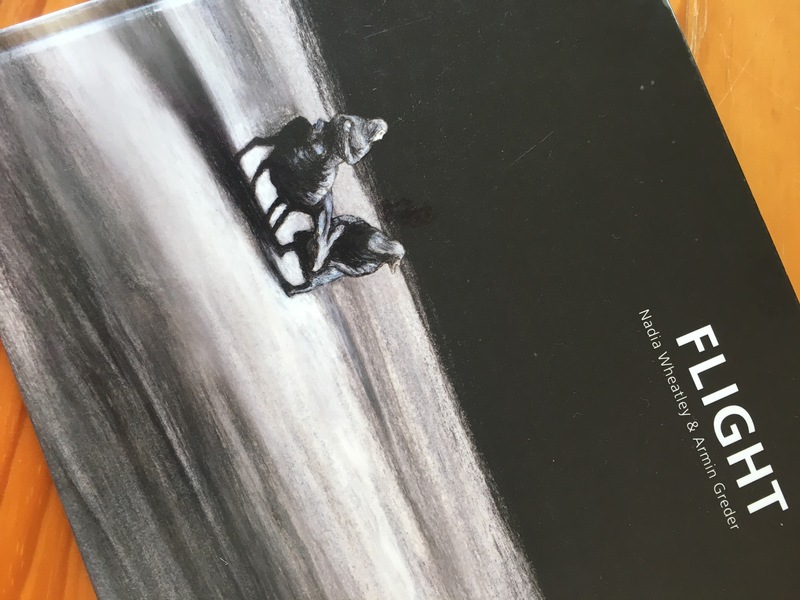 Even wordless books provide children with vocabulary as they have to think about it and create their own words to match the story. Picture books expose children to world issues that may be too complex to grasp. The aim of my blog and this Facebook page is to enlighten parents, teachers and children about picture books that focus on how we can live more sustainably and equally. If you take the time to sit down with your child and read a book that addresses a topical issue AND have a short discussion or follow up activity they will start to understand these big issues sooner and on their own level. Why read picture books #3? Every picture book exposes children to different ways to illustrate stories. Children can view painting techniques, ink, water pastels, crayon, pencil, collage and many more! We can view art works that expose us to different perspectives, different viewpoints and different techniques. In many cases the art of the book is what captures our imagination. When we read books by ourselves we connect with the author, illustrator and characters. When we read out loud we connect with those around us. We listen to the voices they use to tell use the story. We listen to how they read the story and we can share our thoughts as we read. 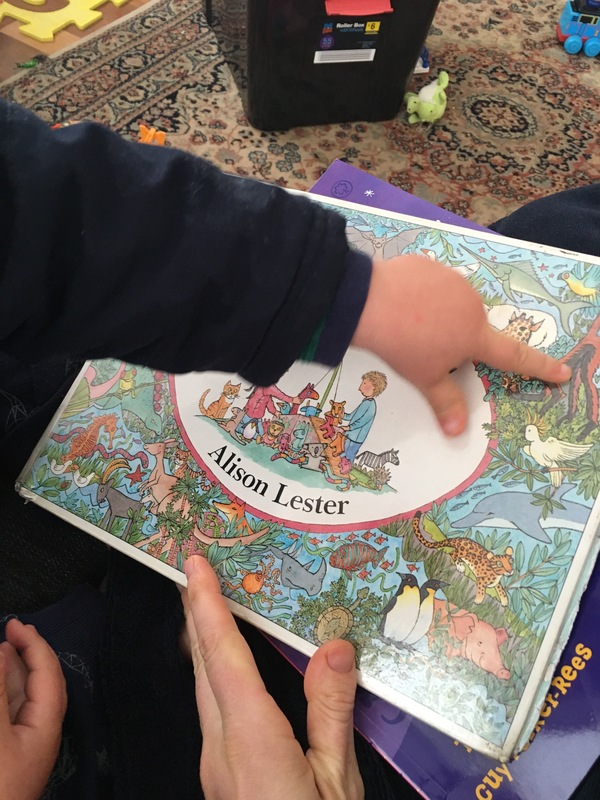 Reading with our own children brings about a closeness that is different to achieve in any other activity. We can laugh together, be surprised together, wonder about the characters, question interesting things in the images and just have a cuddle! As we look at the illustrations we are playing as we are seeking out hidden pictures, secret codes or minor characters. We can use ideas we have read about or seen in a picture book to play a future game with. We can talk to each other about what we have read immediately (as most picture books do not take long to read) and have fun discussing the intricacies of the story. We can talk about how we each saw the book, which characters we loved and who we would like to be. Picture books offer hours of fun and it doesn’t all have to be sitting down! This is a key element in many school literacy programs. Visual literacy is how visual information adds meaning to text. Illustrations incite the imagination, they help us to get more meaning from the text and invigorate our creativity. Books that link to gardening. The Hairy Nosed wombats find a new home. Colours of Australia by Bronwyn Bancroft. How is a river like our body’s circulatory system? How is the river in this story like an idea? Rivers have opened up the world and closed them off. Discuss. A river by Marc Martin (published by Penguin Books) feels peaceful from the front cover. It’s dreamlike illustrations and gentle words found peace and quiet in our reading time today. From a window and the young girls imagination takes the reader on a journey of the river from the busy, smoggy city to the calm and colourful jungle. We see cities, farms, green hills, jungles and mangroves. Animals are hidden within the landscape which give time for wandering eyes to pause on the picture that little bit longer. Through this story you can learn about the endless cycle of rivers and the water within them. It is mesmerizing and meditative, inspiring and illuminating. Find out about your local river. Where is it? Where can you access it? Where does it come from and where does it go? How can we clean a river? Is it possible? What doesn’t belong in a river? What is a river? Is it possible to live without rivers? List the landscapes which the boat went past. How are they the same and different? Collect some leaves. Categorise the leaves into size, shape, colours, lines and points! Use these leaves to re create a picture from Marc Martin’s book, The River! Collect some rain – where can you put the rain? How much was collected? You could keep a rain diary over a month or more. Enjoy – let me know what you think! Creativity seems to be a recurring theme at the moment – and I love creativity, it links in so many different topics and encourages thinking in so many different ways. Fuzzy Doodle is a sophisticated picture book that delves into creativity through a small fuzzy doodle that magically comes to life through eating ink and words. Each page brings our imagination to life as we see this small scribble develop, change and grow into a beautiful butterfly. The pictures are eye catching and children love seeing the transformation of the print as Fuzzy grows. Fuzzy Doodle uses different poetic devices to tell us the story in a sing song fashion and really captures readers of all ages. The pictures are stunning and the illustrator Donovan Bixley has used an array of painting and drawing techniques to show the little Fuzzy Doodle change and grow. So how can we use this at home or in the classroom? Explore the adjectives, adverbs, nouns and verbs used within this story. How does Fuzzy eat the words? Think of as many different words as you can for eating and rank the words from the hungriest type of eating to the least. Rank them from the politest to the rudest types of eating. Create your own doodle and swap with a partner. Ask them to grow and change the doodle so it grows into something. Explore small insects and how they grow and develop over time. Explore why we need insects to make the world go around. Circle is another visually striking masterpiece created by Jeannie Baker. As a young boy watches from the confines of his wheelchair, we learn about the annual migratory path of the Bar Tailed Godwit. The Godwit takes part in a truly amazing journey, covering around 11,000 km in order to breed and feed. Jeannie Baker’s images capture the landscape that the Godwit has to come across, highlighting the damage the humans are doing to not only the land by over developing but also to the many migratory animals who rely on different areas of the world to take part in their life cycle. Circle teaches us about the Godwit’s journey through imaginative language and beautiful scenery. It allows the reader to take into account the difficult journey that these birds need to take every year in order to survive. We also see the length of time through the eyes of the young boy as by the end he is out of his wheel chair – yet still dreaming of flying. This is a beautiful book which can be read by all ages and understood in many different ways. SO how can we use this book in the classroom? What is a God wit? Where do they travel throughout the year? Look for other animals that can be seen, note them so you can find out more about their migratory paths. Research a migratory animal which has been effected by human development. Find out how it has been effected and if the animal has made it’s own changes to the path or if it’s numbers have gone into decline. Compare and contrast the different animals. Life cycles: Map out the life cycle of the Godwit. Examine the different parts of their life cycle and predict what might happen if the wetlands disappear. How do scientists know where these birds migrate to? Can you create a better way to monitor the birds migration patterns? If the Godwit’s cannot land in China, what are the roll on effects for not only the Godwit but other animals or plants? Could it land elsewhere? Investigate the terrain and habitats needed by the Godwit. Would humans have a better understanding of the world if they still had a path of migration? Human over development: Where in your own community has over development taken place – ask this question before you provide any materials. Look at different case studies of over development and if any action is being taken place to rectify the issues. Look into why we have National Parks and world Heritage areas and how they have protected areas. Places to look at include: The Great Barrier Reef, Tasmanian forests, Galilee Basin, Murray-Darling River, Clarence FloodPlain, Collaroy Beach (storm of June 2016). Learn more about some great places to visit around Australia. Man made structures are abundant but so are the natural ones. How can we ensure that visitors to Australia visit both and why do we want to encourage the visiting of both man-made and natural? Check out these top 100 places! Do we need National Parks and World Heritage areas? Research great migrations of the past they may not happen any more. Do animals really need to follow the same path of migration? Do humans follow paths of migration? Collect Data on the numbers of decline in chosen endangered animals. Collect data on the numbers of animals that are no longer endangered and compare to the endangered animals. How have different animals risen in numbers? Why are numbers, tables and data collection important to the survival of animals? How do images engage us? Use the images from Circle and from other Jeannie Baker books to look at how her artworks engages you in the story as compared to drawn images. Circular stories – This book follows a path, a journey. Can you find other stories which follow a circular pattern? Are there any animals that visit your house on a seasonal basis? Try to find out more about them. Keep a bird, animal or insect diary. Create your own collage like Jeannie Baker does. Collect local bits of nature to create a scene which represents being outside to your child. Jeannie Baker’s books are always wonderful and this one tops that! “Soon, my darling,’ his mother promises him, ‘we will reach our new home’. Flight is a confronting story about a young family fleeing from their home in search of refuge. Drawn in shades of black and brown the images add to the feelings of unknown these travelers must be experiencing. It is dark and fearful but throughout the pages we see hope. The story begins like that of the Christian Christmas story – a small family leaving there home town in search of safety: following the stars and riding on a donkey, but as we read along we discover this is a small Muslim family who are escaping their war torn home. This book is one that needs to be read to older children with reflection and questioning. 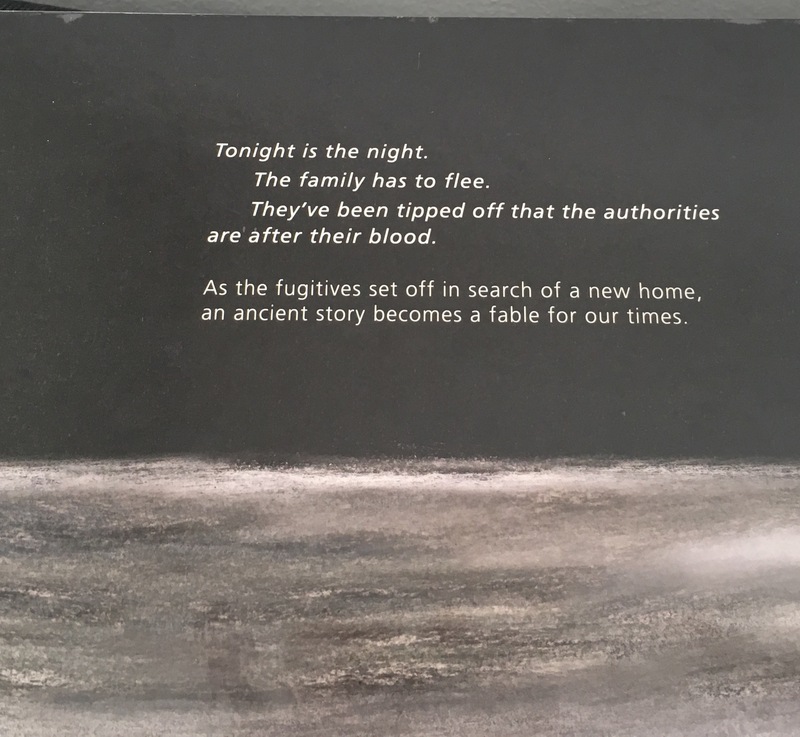 However, if you have a younger child or class, you can read it to them, but be prepared to explain why the people are running from their home, why there are flames, tanks and sad faces within the drawings. It is very confronting yet realistic. There are some great classroom teacher guides out there but what can you do at home? Remember if you do wish to read this book with younger children you can just look at the images and discuss what it would be like to live in a place where there is war. What does flight mean? Look at the front and back cover. What is a fugitive and what might have the family done? Modify some of the language if you need to. THINK: What might happen to the family? You can get involved with Australian refugee organisations if you wish to do something small. Talk about how you feel about this book and ask your child/children how they feel. Talking about feelings is a great tool and will help your child to express themselves. Let them know it is ok to feel sad and talk about how you can help in a small way. Look at a map of the world to see where refugee camps are and where refugees come from who are now in Australia. Look up some famous Australians who were refugees. Anh Do’s book: The Happiest Refugee is a great place to start. We can see where is he now and what his family had to go through to be here. What is a Bogtrotter you might ask? He is a delightful creature that lives in the bog – a gloomy, marshy, mushy bog! Bogtotter, written by Margaret Wild is a book that focuses on belonging, trying new things, playing outdoors, loneliness and discovery. So how can we use this book? Get outside more often. It is easy to be inside with all of the gadgets, toys and applicances but some of these can be used outside too! Grab a pile of books and read them outside, take a picnic blanket onto a small patch of grass and set up some games, eat lunch outside, take photos, pick flowers/grass/leaves! there are so many things we can do outside. Learn outside – many teachers spend all the teaching time in the classroom. Is it possible to have at least one lesson outside? Start with one a week then build it up. Try something new – even if it is something small, once a week. You are opening yourself up to new experiences which in turn helps your thinking and view of the world. In order to understand the world and the issues within we need to get out. We need to try new things, read new things and listen to others ideas. Ignorance really is bliss but there is so much out there in the world that by trying something new or listening to someone else’s thoughts actively, we can really make a difference! What is a Bogtrotter? What is a bog? How will picking a flower change his life? Retell the story in your own words using the pictures to help. Which words from the book will help you to tell the story in the most interesting way? Why does Bogtrotter only say ‘Ah’ (this allows us to think more, perhaps he only needs to say ah) If you were to re tell this story – would you change this? Cycles: Draw up the daily cycle of the Bogtrotter at the beginning of the book. Add to this or draw another to show how his cycle evolved over time. Link this to how we can make small changes in our life to make a difference in how we feel. What are the main themes here? See what the children can come up with. Ask them to give examples through words used in the story and images drawn. Persuasive text: Why should we make changes? Why should we play and learn outside? Link to Choose your own Adventure stories – How can we choose our own adventures? Look at these great planning ideas. Thought bubbles: How would we write this as a comic strip or a story which uses thought bubbles? Discuss how thought bubbles can tell a story and create one! Bogtrotter feels lonely but through meeting a frog, he is inspired to make a change. Discuss how children can make changes to their life to improve it. Write down a list of things they would like to change and a plan on how they can change it by themselves or through the help of others. Draw on the importance of community and that loneliness is one of the biggest causes of depression. OI.5 World views are formed by experiences at personal, local, national and global levels, and are linked to individual and community actions for sustainability. OI.7 Actions for a more sustainable future reflect values of care, respect and responsibility, and require us to explore and understand environments. 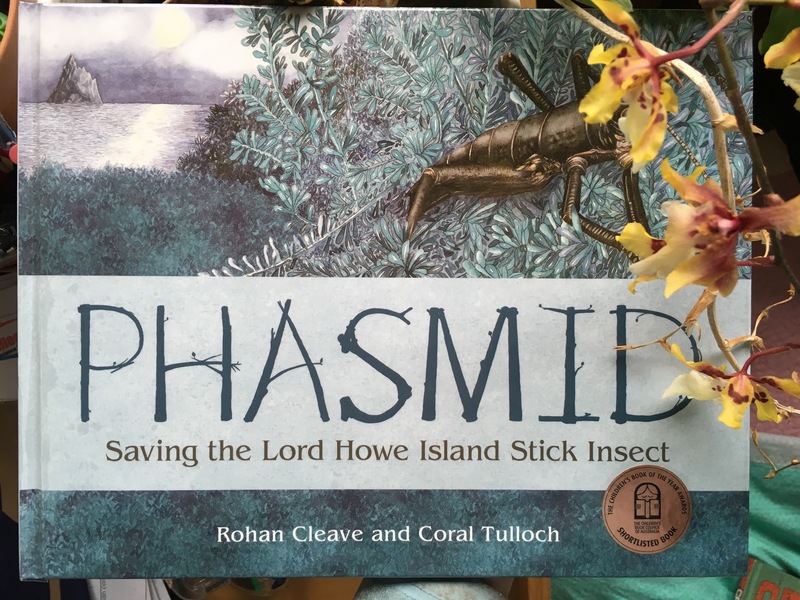 Phasmid: Saving the Lord Howe Island Stick Insect is not only a remarkable read but it is also an extraordinary tale of survival and the efforts of Australian scientists to save a small insect. Jane Goodall gives a forward in this book also. Believed to be extinct, these intriguing insects were found on a rocky crevice offshore from Lord Howe Island. Children will love this book for it’s an easy to read story , detailed images and excellent facts. This book will shed light on the destruction introduced species can cause and how even little insects play a major role in our ecosystems. How can we adapt this book for our younger readers? Research another insect that is critically endangered in Australia. If the Phasmid became extinct how would our world change? Have there been other instances where rats have caused problems or extinctions? How can we raise awareness of endangered animals? Create an anthology of different types of writing so that anyone who reads the anthology will be brought in to the importance of the issue through at least one piece of writing. What if there were no insects? What would the world look like? List some reasons why we need insects. If you could be an insect – what would you be? What are some differences and similarities between a Phasmid and a water? Are bugs the food of the future? If they are how can we ensure that we don’t make insects extinct due to our eating habits? As the primary reader you can read through the book, stopping to explain and question the words and images. Here are some focus words. Map: Find a map of Australia and also Lord Howe Island. Look at where LHI is and the location of Balls Pyramid. Phasmid: What is Phasmid? Create a diagram which children can label. What sort of creature is it? How do we know it is an insect? Create a story – Children can create their own story about the Phasmid and it’s amazing tale of survival. Encourage children to take on a different perspective – perhaps we could learn about how it got to Balls Pyramid? How it felt when the scientist took it to the lab? Life cycle – create a life cycle of the LHI Phasmid using the book for inspiration. Learn about how scientists look after animals who are critically endangered. Look at zoo programs. Grug and his Garden is a fun, simple read for our younger readers but there is so much we can do with the concepts introduced here. If we look at this book in a sustainable way we can see how Grug uses everything in his garden – he is self sufficient! Wouldn’t it be great if we all could be like this…but living in smaller houses and closer to the city doesn’t always lend itself to this. However, we can be creative and try to grow as much as we can in order to make some aspects of our life greener and more sustainable. If you need inspiration go and visit the Coal Loader in Waverton – so many wonderful ideas that we can all implement at home in some small way. Visit Milkwood Permaculture’s site for some great ideas on home permaculture inspiration! Or check out Sydney sustainable gardening for some seasonal garden tips! So what can you do in your home or classroom to add a bit of gardening in? Many herbs grow in pots and require less sun (being smaller) AND if they do need more sun they can be moved easily outside during the day as pots are smaller and easier to carry. Plant the seeds according the the correct season they should be planted in. Keep a diary on the growth of the herbs. When the herbs have grown be creative with how they are used in your cooking – this allows children to see that they can create their own food and will hopefully inspire more gardening. Get outside – your backyard, the park or the national parks – get in the soil, look at what is growing in your area. Check out which Herbs are in season. We buy seeds from The Diggers Club. These seeds are heirloom seeds (so many different variaties of tomatoes – not just the one or two we see in store) can sometimes be harder or easier to grow but add so much more diversity to your garden. Grab a soil tester kit and learn about how soil plays a major role in growing your own crops. Check out Costa’s gardening blog for some more inspiration! Connect your kids to gardening: Check out this great blog with ideas for children. Sustainability is creating your own veggie patch, no matter how big or small. Sustainability is supporting nature in the best possible way you can. Sustainability is making, buying and using all that you need to to support you and those around you. Grug sums it all up in this great book. I have just received an email about this wonderful competition for primary school aged children. If you would like to link sustainability and literacy please have a look at the Wilderness Society’s and The Environment Award for Children’s Literature competition. This is a beautiful way to bring to life children’s ideas about sustainability and what it means to them. Some of the books I have blogged about are in their shortlist of the 2016 Environment Award for Childrens Literature. So have a look back through my blog if you need any help integrating these books into the classroom. Phasmid: To come! Follow me for updates! Once I heard a little wombat: To come! Follow me for updates! Mister Cassowary: To come! Follow me for updates! WATCH THIS SPACE! OR HEAD OVER TO FACEBOOK AND LIKE MY PAGE! Quoll by Sandra Kendell was published in 2008 but is still a poignant book that addresses the issue of feral and introduced animals in Australia. This book is full of sadness in that the poor Quoll needs to leave her home because the Cane Toad has invaded her habitat. However, the author Sandra Kendell makes us think during the book. When the Quoll meets the cane toad the cane toad is portrayed as a thoughtful creature who just wants somewhere else to live! It made me think – are cane toads really that bad? Do they just want somewhere to live? But then common sense prevailed and I knew that although they are animals and have a right to live the fact is they are taking over habitats of the native wildlife. They do need to be stopped. There are great organisations out there in Australia working hard to help these amazing Australian animals. Australian Quoll conservancy is one of them. So how can we use this book with our young readers? How can we raise more awareness? What are feral animals? When is an animal feral? Explore how some animals which are problematic here are not overseas. Do we need feral animals? Do we need introduced animals? Explore rabbits, cane beetle and cane toad! Is it fair that we allow introduced species into the wild? Are there penalties? If there were no feral animals /introduced species. in Australia would there be other issues? Write a letter to your local council member outlining the problems pets can cause if they are not looked after properly. Present an argument for feral animals/introduced species. Encourage this to be done through an anthology of writing pieces. Children need to know that to spread a message we need to think of our audience. AND our audience members all see, hear and think differently. SO by writing an anthology full of different pieces of writing we will grab everyone’s attention with at least one of those pieces of writing. This could include: Comic strips, arguments, narratives, picture books, documentaries, poems, songs, explanations and descriptions just to name a few. See my teacherspayteachers store to purchase this great unit of work. Look for statistics on feral animals – look for their numbers over the last 50 years. Look for statistics of local native animals and their rise or decline. Look at maps and the spread of the feral. Explore endangered animals, extinct and endemic! What is a cane toad? Where did it originate? Why did it come here – create a time line of the cane toad. What is the life cycle of a cane toad? Look at how they reproduce and how many young they can have! What is a Quoll? Where does it live in Australia? Explore the life cycle and habitat of a Quoll. 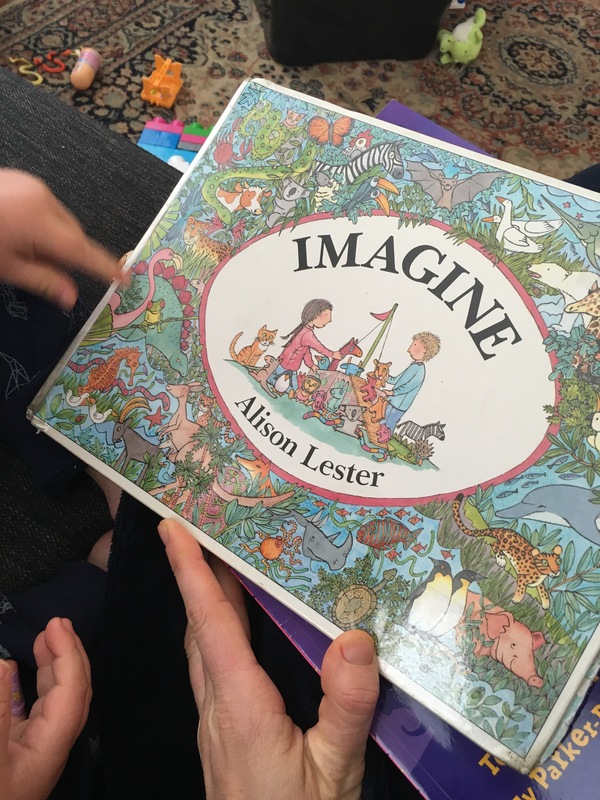 Imagine by Alison Lester, published by Allen and Unwin, is a wonderful book which enlightens young readers of the habitats for different animals of the world. The two main characters explore different places animals live in the world through their imagination. Imagine brings to life unknown animals, unknown areas of the world and most importantly how we can learn through play and imagination. We loved reading through the different animal names which bordered each page and I even had to research a few! This book opened us up to many things and it can for you too. Which animals live in more than one type of habitat? If you could live in one of these pictures, which one would you live in? Find the similarities and difference between two habitats of choice. Find the similarities and differences between at least two animals of choice. Can you imagine one animal moving to a different habitat? What would it have to change to survive? The Magnificent Tree is a beautiful collaboration by Nick Bland and Stephen Michael King. It was published in 2012 by scholastic but is ties in well with National Tree Day this weekend. The book’s main characters display a loving and respectful relationship between a granddaughter and her grandfather. The young girl loves doing things simply and the grandfather loves ideas that are ‘big, brave and brilliant’ but together they can work together to come up with wonderful ideas! One day Bonny and Pop decide they need something so they can see the birds better. Pop thinks BIG and starts to draw his ideas whilst Bonny thinks simply and plants a seed with care. We can draw many different teaching points from this book whilst enjoying the fun illustrations. Trees are magnificent! Are there many trees, shrubs or flowers around you that you think are magnificent? Why are they each magnificent? Can man made objects be part of our landscape? How can we improve our man made landscape to make nature a part of it? Look into new ways cities are becoming greener with rooftop gardens and green spaces! Create a tree diary. How many different tress are in your school? Home area? playground or local bush land?Some great ideas on this blog for looking at the amazing Banksia! What can you grow in your backyard or own your balcony? Can you make a simple toy to play with? Find some bits and pieces around the house that are no longer needed. This is a fantastically fun activity and it allows children to use their imagination and be creative! Create a toy that can be used outside. It will be amazing what it created if not given too many boundaries. You might like to encourage some planning and you may like to challenge them by limiting the amount of objects they can use. Try it! What are ideas? How many different ideas did Bonny and Poppy come up with? What is a simple idea? What is a complex idea? Create a list of ideas and place them into categories. Draw up your own inventions – one that is simple and one that is complex. Both need to fulfill a similar purpose. How does a seed become a plant? Look at the life cycle of different types of seeds. This is a heart warming story which shows a loving and respectful relationship between grandfather and granddaughter. A great one to read on grandparents day! It also shows that simple ideas can be wonderful so encourage those simple ideas from your children and students as from little things big things grow! !